*Please note that this will be my last official post until January. Happy holidays! I love writing in coffee shops. I’ve talked about it before here and here (and maybe elsewhere). There’s a shop in town I really like to go to in the wintertime because they have a bunch of slouchy couches that are set around a gas fireplace with a large bank of windows behind it. So you can drink your hot cocoa, watch the snow fall, and dream. Good stuff. But when it gets colder, it’s harder to ignore the parts of the real world the sunshine hides. Given that this particular coffee shop is in the middle of town, people from all walks of life congregate here. Last year, with temperatures in the teens and twenties, sometimes homeless people would come in for a few minutes of warmth and beg for money. Depending on how busy the baristas were, they might even be able to sneak a spot on one of the couches and rest awhile before the baristas chased them out. One time, I was busy scribbling away in my notebook and happened to look up and catch the eye of a man sitting across from me. He said something I couldn’t make out. 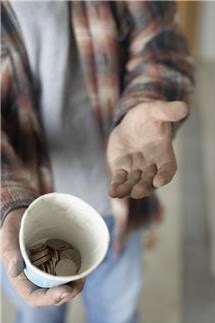 He mumbled again, and I realized he was asking me for money. I’m a debit card kind of girl, so even if I wanted to, I had no spare money to give. He was soon kicked out after catching one of the employee’s notice. But that was my picture of poverty. Last year. This year, it’s already different. Poverty is different. Last week, as I sat down in a comfy armchair in front of the fire, the guy across from me started chatting about the weather. Said he was just hanging out after doing errands at the Target across the street. He was nice enough, but he would not shut up. I finally had to stop looking at him and keep my responses to “Mmm-hmms” and “Uh-huhs” until I got my notebook out and got down to work. He did the same thing to another coffee visitor who happened to sit nearby later on in my visit. That in itself isn’t remarkable. Just a chatterbox making small talk. But then I saw him again a few days later. Wearing the same clothes and nursing a small cup of coffee. He was carrying the same doubled-up Target bags too. The first time I saw his bags, I thought he was just being overprotective about the stuff he bought – after all, plastic bags are notoriously flimsy. But seeing them again, seeing the wear on the outermost bags, I realized they were carrying something far more precious. The extent of his belongings. Despite appearances, this man was homeless, but still made a point to buy a coffee to “rent” space by the fire for a few hours. To make smalltalk with other patrons as if nothing had changed. I wondered what he did after he left the shop. And I felt bad for cutting him off that day he tried talking to me – even though I do that to anyone who bothers me when I’m in the writing zone. I realize I have a rather whitebread perspective of the world. But it doesn’t change the fact that my notion of poverty has changed. It is more insidious than ever, striking people who got by just fine in years past. People who never expected to be out on the streets. People with enough pride to legitimately buy a cup of joe to stay warm instead of begging. It makes me wonder just what poverty will entail in the future, my writerly brain taking inspiration even from this terrible thing. The worst part is I know this man who habits my coffee shop is not alone. And besides donating food and money to charities, I don’t know how to stop it. ‘Tis the season to be merry, but it’s hard to do when so many people are in trouble this year. My heart goes out to everyone who is struggling, and I sincerely hope all my fellow writers are in a good place right now despite the economy. My best wishes to you and yours over the holidays. Just…wow. Thank you for this post. This is such a sad post. Thanks for sharing though. It really makes you think. This made me so sad. And also made me feel incredibly lucky, to have a close family and a tightly knit support system that would probably keep me off the streets, if it came to that. Not everyone has such a safety net. It's good to be reminded of this occasionally.